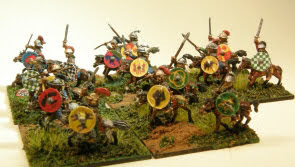 Having been asked to produce Ancients in 1/300th a fair bit over the years we have finally decided to do an Ancient range but to go up to 10mm. Myriad reasons for this but mainly its the extra size means we can depict the armour and dress of the period with greater detail and variations. It also has the benefit of making the weapons more robust. The first offering is Gaul's to be followed by Caesarian Roman.